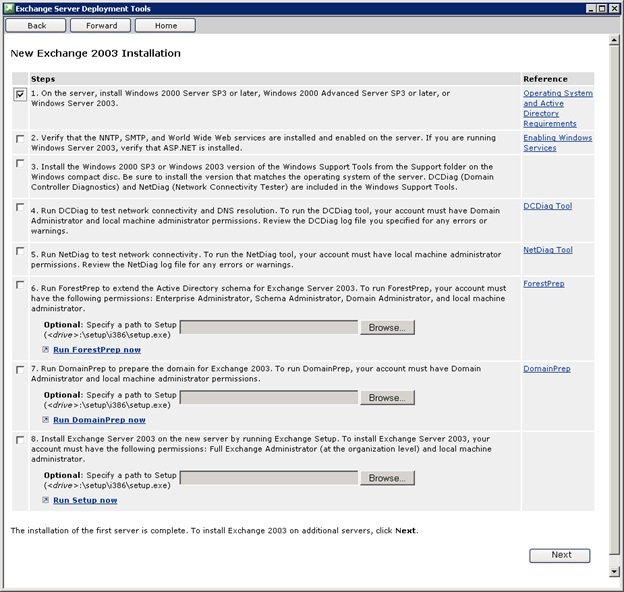 Exchange 2003 is supported in a Windows 2008 R2 forest, but must be installed before subsequent versions of Exchange. Of course, it’s not supported to run it on Windows 2008, you need to run it on Windows 2003 x86. 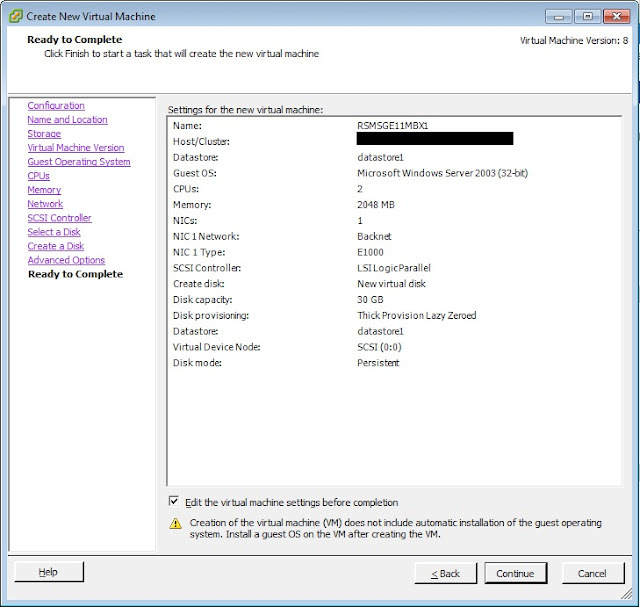 So the first task was to deploy a windows 2003 machine. I decided not to bother creating a template as the number of 2003 machines I’ll be deploying is so small. For base specification I stuck to what I’ve been using for the 2008 Machines with an additional 50GB disk presented from the SAS storage for Exchange Databases and Logs. I’m going to keep the Exchange 2003 deployment very simple, particularly compared to what I’ll be doing with Exchange 2007 and 2010, it’s more included for completeness than anything else. 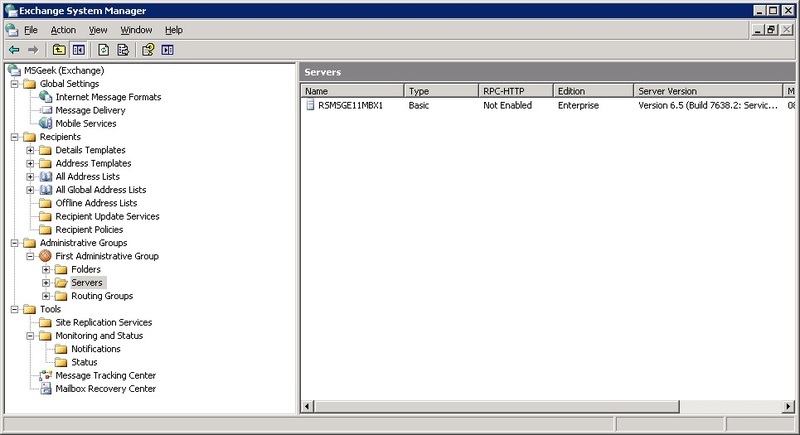 I deployed the base VM with the config below. 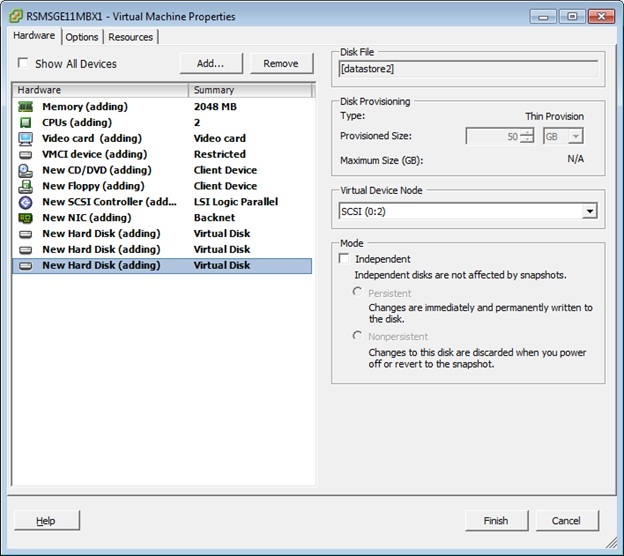 I then edited the settings and added two additional disks – 8GB for PageFile on the SSD’s and 50GB for Database and Logs on the SAS disk. 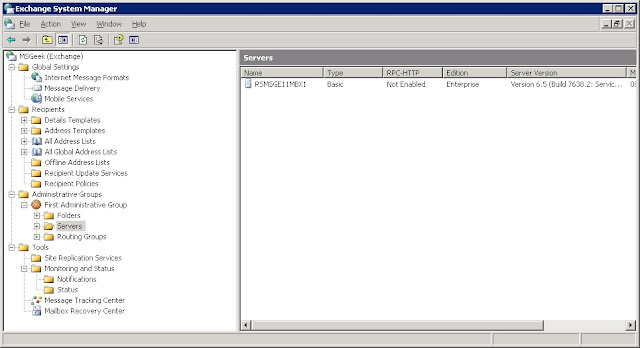 From my temporary VM I downloaded the Windows 2003 R2 SP2 x86 ISO and uploaded it to the SAS Datastore. I attached the ISO to the CD drive and booted the VM. I won’t detail the Windows installation process it’s pretty straight forward. 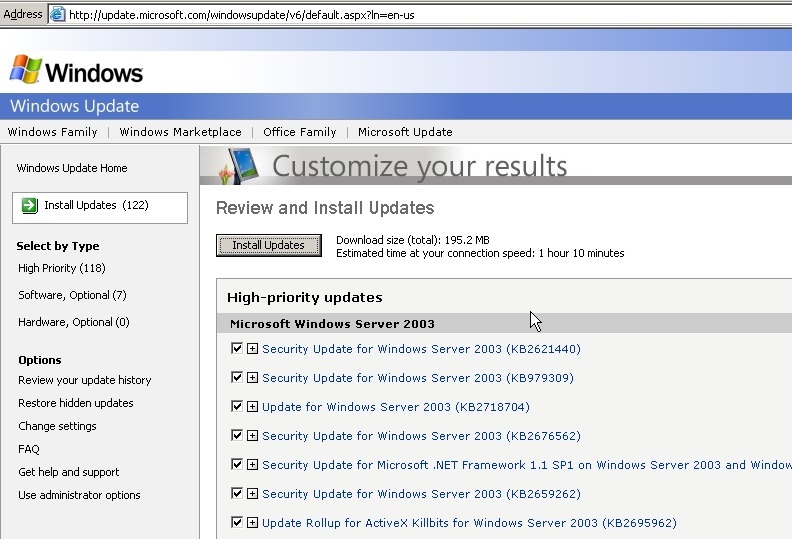 Once inside the guest VM I ran a check for updates, found 118 High Priority and 7 optional. A second pass found a further 18. 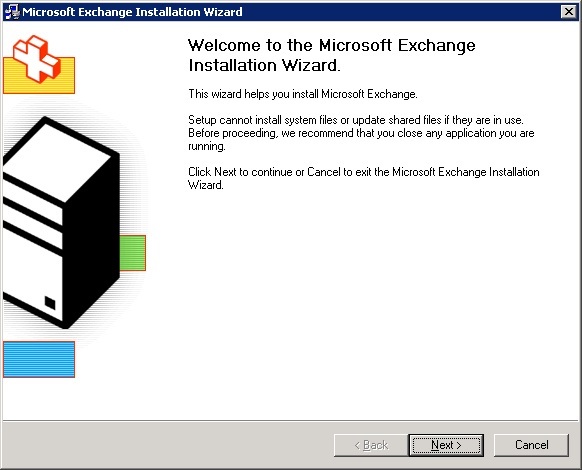 Anyway, after the updates finally completed, I configured the PageFile, enabled remote desktop, and downloaded the Exchange 2003 installation ISO, and I was ready to run setup. 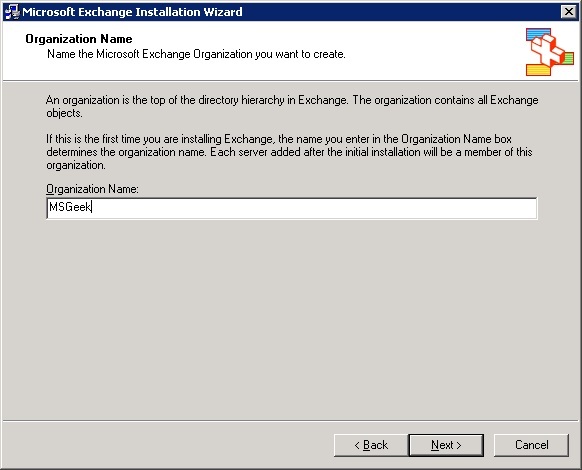 I’m not running any versions of exchange older than 2003, so I selected new Exchange 2003 Installation. After that you get a nice page of tick boxes to work through to complete all the pre-reqs and perform the install in the right order. 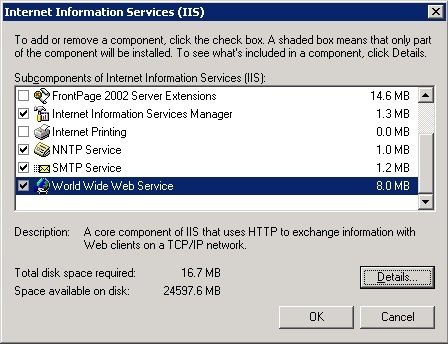 First, I added the SMTP, NNTP, World Wide Web services and ASP.NET. 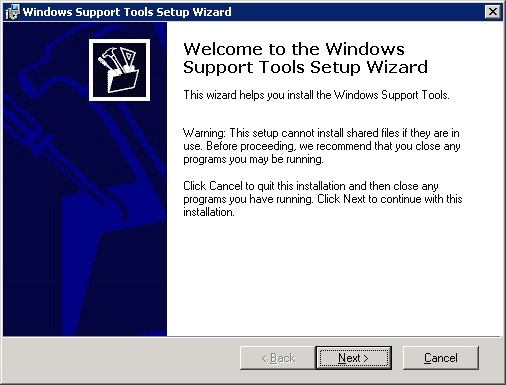 Then the support tools from the Windows installation CD. I ran dcdiag and netdiag which came back OK. I was now ready to run ForestPrep. I accepted the licence agreement and kept the default installation path on C:\. I entered the admin credentials on the next screen, and after clicking next another time, ForestPrep runs. It completed successfully. This also completed successfully. Finally I could install Exchange, I only need Exchange itself and the management tools, so kept installation options at their defaults. 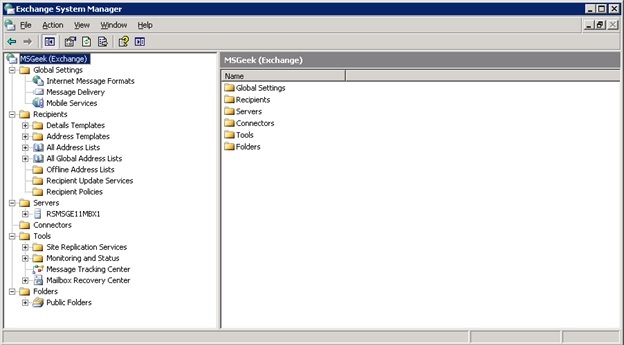 I chose to create a new Organisation and named it MSGeek. From there it’s next a couple of times and setup runs. This also completed successfully. 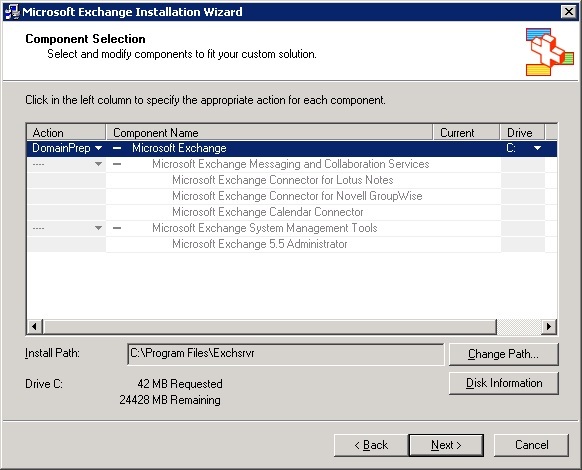 Next I was ready to apply Exchange 2003 SP2. 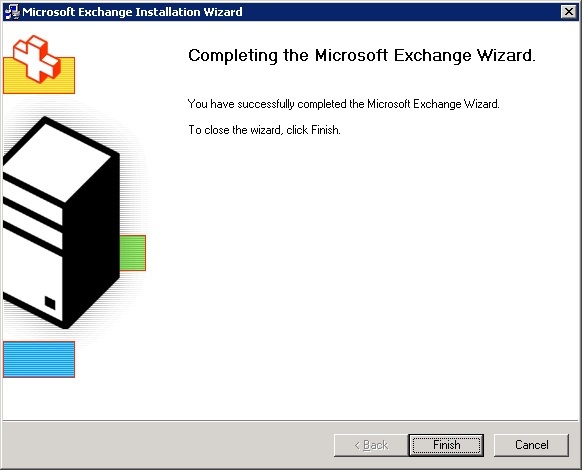 This too completed correctly, and I did and reboot, and ran another pass with Microsoft Update to pick up and further updates for Exchange or the additional services I’d installed. Another 13 updates to install. One reboot later and another pass with Microsoft update and another update installed, the system was finally up to date. From there I could start up ESM. 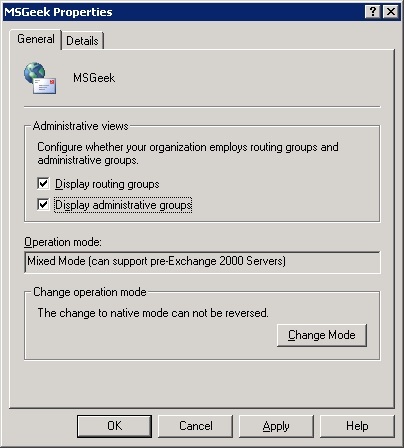 I want to change the default view to show routing and Administrative Groups, this can be done by right clicking the top node (MSGeek (Exchange))and going into properties. That’s better! I’ll go over configuring in another post.